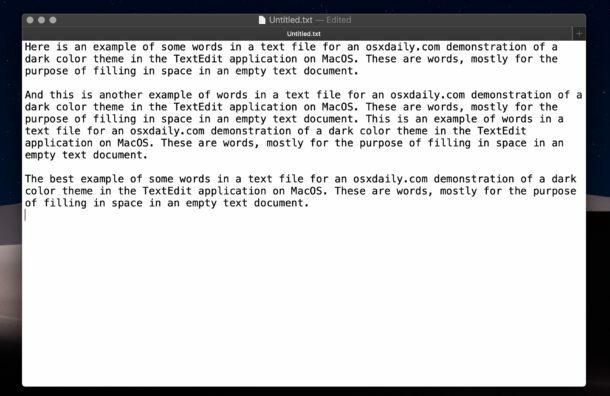 TextEdit, the default text editor bundled with MacOS, now supports a dark mode theme, which basically inverts the color display of the text editor so that white text appears on a dark background, rather than the default black text on white background. 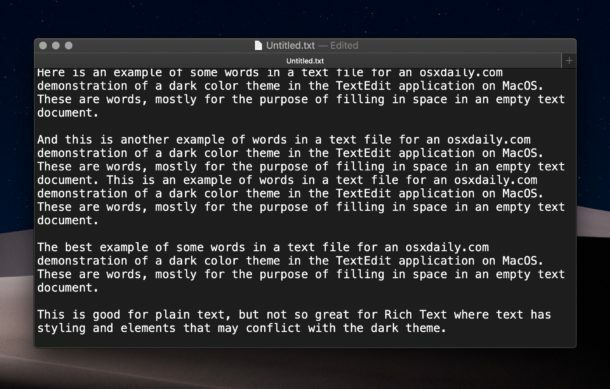 This makes working in TextEdit at night or in low light conditions a bit easier on the eyes, just like the system-wide Dark Mode MacOS feature in general does. 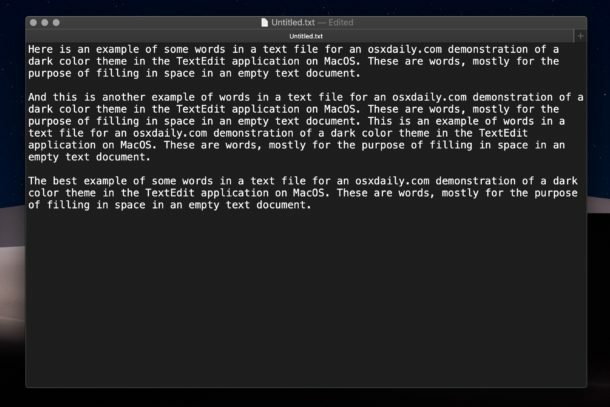 Dark Mode in TextEdit enables itself automatically if you have enabled Dark Mode in MacOS as the general system appearance theme, whether manually or if you set it to activate on a schedule, but if that hasn’t happened for whatever reason when you open TextEdit while in Dark Mode, then here’s how you can turn on the dark text edit theme yourself. Note this will NOT impact the file, file formatting, or styling, it only impacts the appearance in TextEdit itself. This feature works fine with Plain Text documents in TextEdit, but can be a bit more problematic with Rich Text where document styling is used, with colored text and colored or highlighted backgrounds, and other stylistic features in RTF files. If you don’t like the way it looks with Rich Text documents (or in general), you can easily turn it off by unchecking the “Use Dark Background for Windows” option in the View menu. Another option is that if the document doesn’t need to support rich text styling and formatting anyway, you could always convert it from rich text to plain text in TextEdit. You can also set TextEdit to always default into plain text mode in the app preferences. For those of us who use TextEdit as a Notepad type of app with plain text as the default, the new dark theme works well enough, though it’s not nearly as refined as something like the dark themes in BBEdit are. Dark mode support arrived in TextEdit with MacOS Mojave 10.14.2 and presumably will continue into future releases of Mac system software and TextEdit as well. 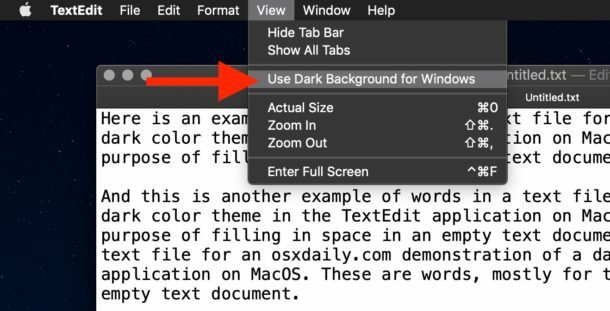 Thus if you have not updated to MacOS Mojave 10.14.2 (or later) yet, you will not find this dark background feature available in TextEdit. It works for everyone on compatible system software. Update to macOS 10.14.2 or later to find Dark option in Text Edit. This is mentioned in the article but I think most people skim. My Mac is at 10.14.1, and there is no option to update the system software. I checked, and it said I was up to date. Interesting that the update is not showing for you, are you on the beta channel? In that case you may find 10.14.3 instead. Otherwise you can always download 10.14.2 Combo Update and install it directly onto a Mac with Mojave. Actually, no, that isn’t true. At least, not when it comes to reading. Read the linked article, and feel free to be impressed by the logic reasoning and scientific facts. Or ignore it as fake news.